Homelessness has become a huge issue in the run-up to the wedding. While it shouldn’t take a royal wedding to raise awareness of the people sleeping rough on Britain’s streets, there’s no denying that Harry and Meghan’s has cast a major spotlight on the issue of homelessness. It was all sparked four months ago, when a local council leader addressed a letter to the Thames Valley Police, demanding that the issue of homelessness be addressed. But for all the wrong reasons. “It is becoming increasingly concerning to see the quantities of bags and detritus that those begging are accumulating and leaving on our pavements,” wrote Simon Dudley, the former council leader for the Royal Borough of Windsor and Maidenhead. “The whole situation also presents a beautiful town in a sadly unfavourable light,” he added. It sparked a furore that drew condemnation for his comments from Prime Minister Theresa May, charities, and members of the public, and made homelessness one of the key issues to be watched in the run-up to the royal wedding. 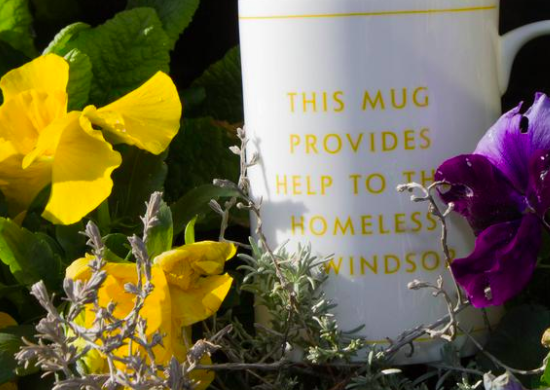 But one charity, the Windsor Homeless Project, is taking advantage of the royal wedding fever in order to support the local homeless community by selling a range of merchandise to raise funds. The collection — excellently named ‘For Richer For Poorer’ — features postcards, mugs, fridge magnets, tea towels, T-shirts, and bunting. 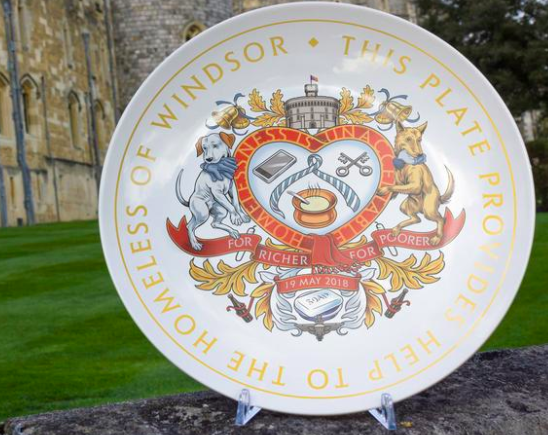 And for those feeling particularly extravagant, or generous, there’s also a commemorative plate on sale for £5,000. All profits will be spent on supporting Windor’s homeless population, funding toiletry kits, clean clothes, hot meals, and mobile phones and credit. The charity has also joined forces with philanthropic greetings card company called thortful, to create two designs of celebration cards. The cards will be sold on the day by Windsor’s homeless population, as an expected crowd of up to 100,000 people descends on the town. Given the media spotlight on homelessness in Windsor, and the council’s former controversial comments on the issue, there are lots of reports circulating on social media this week about what the situation is for homeless people now in the town. Some reports claim that homeless people are being moved from the streets (while royal fans are being allowed to camp out to reserve good spots), and others say that homeless people are having their possessions removed by police. “I can tell you that last week all of those that are having to bed down in doorways were approached and asked if they would like their belongings to be stored in a safe place over the wedding period as EVERYBODY will be bag searched as the security rises and it will become an annoyance at the very least,” the charity said in a statement on Facebook. Harry and Meghan previously named the homelessness charity Crisis as one of seven organisations that they would like donations made to in lieu of wedding gifts. “The fact that the royal family has chosen to highlight this issue and Crisis particularly… is a massive opportunity to make sure the public understand what’s causing it and the fact that we can solve it,” said Crisis chief executive Jon Sparkes. Sparkes told the Thomson Reuters Foundation that rough sleeping is expected to rise by 76% in the next 10 years if the government doesn’t intervene. Parliament passed the Homelessness Reduction Act last year, with the aim of increasing local councils’ obligations towards homeless people, and with the target of building 300,000 new homes a year by the mid-2020s, to take the pressure off the UK’s housing. Global Citizen campaigns to achieve the UN’s Global Goals, which include action on creating sustainable cities and communities and providing access to adequate, safe, and affordable housing for everyone. You can join us by taking action on this issue here.